Doing well in class is hard. Use these study tricks to earn that A. Step 1. Write down important ideas in class. Do not copy everything the professor says word for word- there is no way you’ll get it all down. Just write down key concepts to study later, and maybe important facts/ideas you really need to know. Actually revisit these notes. Step 2. Make flash cards. 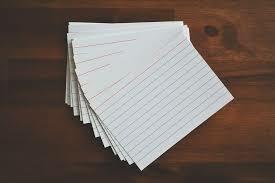 If you make and use flashcards for every class, eventually your brain gets trained to remember the information when you use it that way. Study those flashcards. Ask a friend to quiz you. Put cards aside when you really know the information. Read more about the information on the cards that still stumps you. Step 3. Do the reading. Even reading something once might set off a bell in your brain during an exam. Do the reading before class, that way listening to lecture will help reinforce what you already know. Step 4. Ask questions. The thing you’re bound to get tested on is the thing you didn’t understand and didn’t ask about. Step 5. Go to any and all review sessions there are. Worst comes to worst, you find out you did not need to because you were already that prepared. Plus, it shows your professor/T.A. that you’re trying if you don’t do well on the exam, and they’re likely to be more lenient if you need to ask for help boosting your grade later. Step 6. Chill out. You’ve got this.